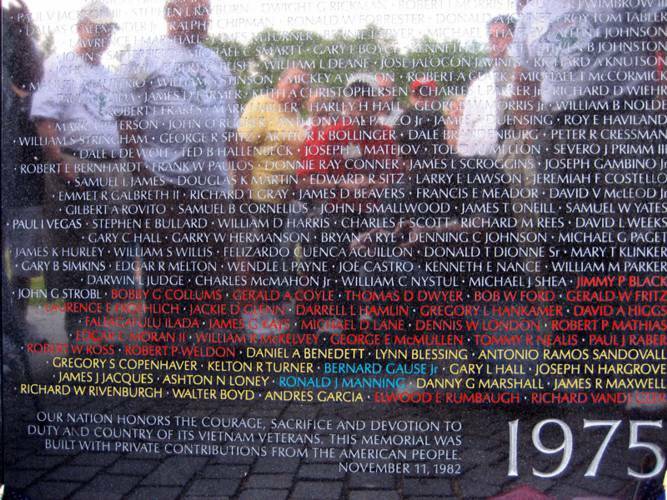 Along with the last 41 names on the Viet Nam Wall, we are the Veterans, Families and Friends of the Mayaguez incident on May 15, 1975. It is our hope that this site will become a place where our fellow Golf, Echo, and H&S 2/9 Marines, Sailors, and Air Force Personnel as well as their friends, and families can find comfort and support to this oft-forgotten chapter of American history. Picture above taken by Fred Morris in 2006 at the "Call to the Wall" reunion. The people you see in the reflection are Koh Tang Vets and families. Names in Red are USAF, Blue names are Navy, and Names in yellow are USMC who were killed in action May 15, 1975 or in related actions. Go to the What's New Page for the latest news! Send mail to Webmaster Fred Morris (kohtangmorris@kohtang.com) with questions or comments about this web site.